Despite prodromal labor not being mentioned in the most common pregnancy books, you’ll still hear it frequently being discussed among friends, with care providers and in online communities. Because of this discrepancy, it makes sense that there is confusion and frustration surrounding the topic. 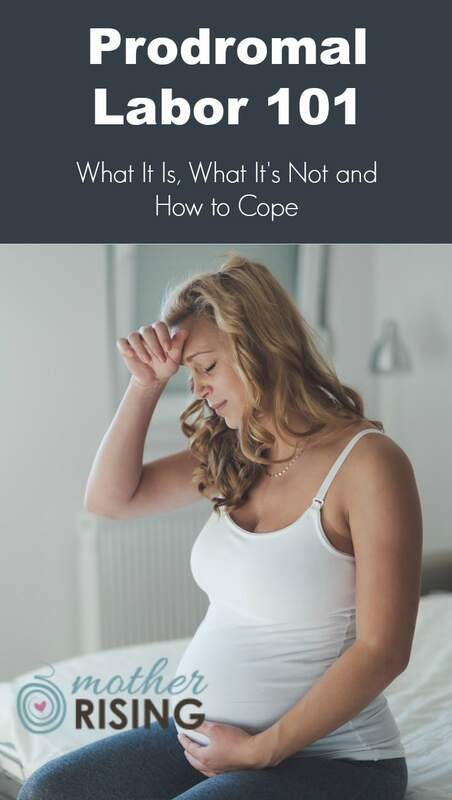 In this post I hope to define prodromal labor, but more importantly offer solutions and encouragement if you find yourself experiencing this frustrating phenomenon. By definition, the word prodromal means the symptoms one experiences before the onset of the actual condition. For example, if you’re about to get the flu, your prodromal symptoms may include a mild sore throat, runny nose, fatigue, etc. During pregnancy, prodromal labor will include symptoms of labor (ex: mild to strong contractions) that unfortunately aren’t progressing into a normal labor pattern or significantly dilating the cervix… YET. Prodromal labor is different than the common braxton hicks contractions that most women experience during the latter half of pregnancy. Braxton hicks contractions are generally mild, sometimes on only one part of the uterus, and do not become longer, stronger and closer together. Braxton hicks contractions can be stopped by rest, sleep, hydration and/or a warm bath or shower. These contractions tend to have an irregular pattern to them. Compared to braxton hicks, prodromal labor contractions feel more like labor contractions – they’re stronger and can’t be stopped by rest, sleep, hydration and/or a warm bath or shower. Does Prodromal Labor Dilate the Cervix? Prodromal labor can sometimes change the cervix (soften it or move it from a posterior to an anterior position) but does not produce contractions that become longer, stronger and closer together that significantly dilate the cervix and deliver a baby. If you are experiencing prodromal labor and your cervix has dilated up to 6 centimeters, you are actually experiencing early labor and not prodromal labor. This is a good thing! Woohooo! Prodromal Labor or Early Labor? Prodromal labor is a variation of early labor. The difference between prodromal labor and early labor is that the contractions of early labor get longer, stronger and closer together but also dilate the cervix up to six centimeters. Some women may never experience prodromal labor, but most will have some form of early labor. If you are experiencing the following signs of labor, you may be experiencing prodromal labor. Prodromal Labor or False Labor? Since the terms prodromal labor, false labor and pre-labor are used interchangably in our culture, it can be confusing to know what’s really going on, what it means and how to respond. 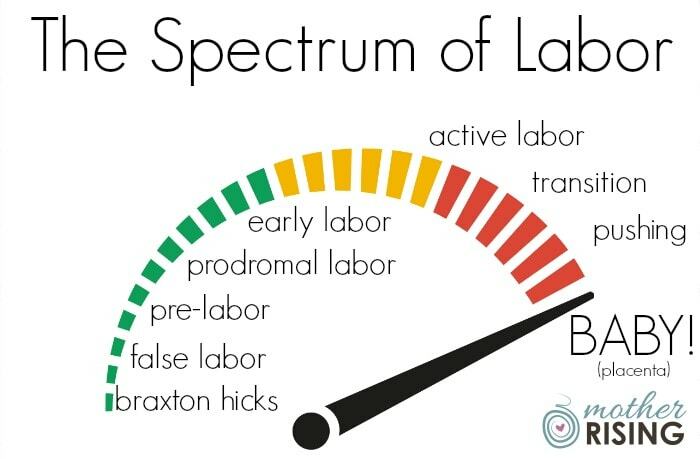 As a doula and childbirth educator, I’ve never used the term false labor with any of my clients. What a woman experiences at the end of pregnancy, no matter what it feels like or means, is not false. Using the term false labor with a woman can be extremely disheartening. False labor is the end of pregnancy contractions that are stronger than braxton hicks and can be easily mistaken for early labor, especially with women who have never experienced childbirth or been around someone in labor. False labor contractions do not get progressively longer, stronger and closer together and will go away after rest, hydration, bath or a shower. TIP: The best thing to do in this frustrating time is to go about your normal life as much as possible. Make rest priority number one and stay well hydrated and fed. Don’t try to “be in labor” but accept this state of being as part of the end of pregnancy. I promise it will end! Sometimes the symptoms of labor aren’t as black and white as we would prefer, but instead fall on a spectrum. For example, pre-labor is stronger than false labor, prodromal labor is stronger than pre-labor and so on. In my experience, if you are experiencing strong, sometimes irregular, but noticeable and timeable contractions every evening for a week straight, but things fizzle at night and you eventually get to sleep, this is not prodromal but pre-labor. … this is likely prodromal labor. Looking at the above image of the spectrum of labor can help us to see how things generally progress. Some women experience very little of the “early stuff” and cruise right on into active labor (or transition!). For these women it’s pretty straightforward what’s happening. On the other hand, some women may spend a little (or a lot) of time in the “early stuff” which can be confusing and challenging, to say the least. No matter what you’re experiencing, it is real, difficult and a normal part of the end of pregnancy. I promise that it won’t last forever and will end sooner rather than later. You can do it! SIDE NOTE: The night before my daughter was born I experienced pre-labor. I even had my midwife come over to my house because I thought it was the real deal! In the blog post I wrote that what I experienced was prodromal labor. See? These terms are thrown around with no care. HA! I think what matters most here, however, is that she was born soon after. Babies come out! How Long will Prodromal Labor Last? Because prodromal labor cannot be stopped by rest, hydration, or a warm bath or shower, prodromal labor does not go on for weeks and weeks (as I’ve heard some women say). Prodromal labor can last for days but not weeks. Again, rest is the number one priority in these situations. Rest always trumps “trying to be in labor” unless there are other factors at play (like a ruptured amniotic sac). Can You Speed Up Prodromal Labor? As your virtual childbirth educator, I encourage you to spend your time and energy on resting, eating and drinking rather than on ways to speed up prodromal labor. Assuming you are prioritizing these things, you may find success with the following ideas to get labor going. Can Stripping the Membranes Cause Prodromal Labor? I believe that stripping the membranes could cause any of the “early stuff” to happen, prodromal labor included. Why Does Prodromal Labor Happen at Night? Prodromal labor or not, women generally begin their labor experience at night. If a woman is experiencing prodromal labor and it seems as if she just needs a little bit of a nudge to get things going, odds are that the next night things will pick up. I believe that we are more likely to go into labor at night because our bodies are more relaxed, we’re “in our nest”, we feel safe and ready to give birth naturally. How to End Prodromal Labor? Ok, that answer is not that funny or helpful. Sorry… I couldn’t resist! The best way to end prodromal labor is to be patient, stay relaxed and remind yourself of the truth —-> Prodromal labor means that you’re in the home stretch and you get to meet your baby soon. What you’re experiencing is normal and there’s nothing wrong with you or your baby. You can do it! Yes, prodromal labor contractions can be painful. However, I think the bigger challenge in these scenarios is fatigue rather than pain. Sleep and rest are priority number one, followed by nourishing the body with food and water. If a woman can meet the basic needs of her body in this way, prodromal labor will be easier to overcome. Unfortunately, some women also experience vomiting alongside prodromal labor. In these circumstances it’s important to be communicating with your care provider as dehydration makes things worse. Check out my post about how to stop throwing up in labor for some good ideas on how to feel better. You got this! I believe that prodromal labor can sometimes be caused by a malpositioned baby. A stopping and starting again, but never fully going away sort of labor could be your uterus’s way of trying to reposition a baby. Spinning Babies has a lot of good information about this, but The Miles Circuit, a similar technique, is easy to implement without wading through a pile of information. Sometimes when dealing with prodromal labor, easy is what’s best and what actually gets done. A woman planning for a VBAC is not exempt from prodromal labor. From what I can tell, prodromal labor does not increase a woman’s risk of uterine rupture. Does Prodromal Labor = A Shorter Labor? Because rest is priority number one but also extremely difficulty to achieve, some women, alongside their care providers, choose medicine to help cope through this frustrating time. The following are some of the medications women take to cope through prodromal labor. For those that need to rest but can’t, but also don’t want to take the above medications, sometimes find success with a warm bath and a glass of wine. Prodromal labor is a normal abnormality. It does not mean that anything is wrong with you or your baby. It does not mean that your uterus is broken or that your body does not know how to go into labor. Nor does not mean that your body has failed and that medical intervention is the only way out. What prodromal labor absolutely means is that you’re at the end of pregnancy and you get to meet your baby very soon. Remember, make rest and nourishment your number one priority. You can do this! Leave a comment and let me know your experience with prodromal labor. What worked or didn’t work for you? What would you do differently next time? Thanks for clearing that up. With my 5th child I had contractions every 5 minutes for 36 hours (12 of which I was in the hospital) but they didn’t dilate the cervix. So they said it was “false” labor. It felt pretty real to me, and it wasn’t my first. This information was very helpful in helping to differentiate between the contrasting assumptions versus the actual facts that are commonly associated with labor. Depending on which labor procedure you choose to carry out, will it effect the process of pushing? If I’m understanding you correctly, you’re asking if the experience of pushing can be altered by which type of birth we choose? If that’s the case then my answer is yes. For example, women with epidurals will generally have a longer pushing experience than if they did not have an epidural. Thank you for clearing this up! Some folks throw around the term ‘prodromal labor’ like it covers every belly squeeze that occurs before active labor… So I googled it and found this. This article is so helpful. In your experience though, have you ever known someone to dilate with prodromal, then go backwards just to get hit with prodromal labor again? I dilated to 2cm and 50% effacement after about 36hrs of prodromal labor, then it stopped, then a few nights later I was hit with something stronger for about 8 hrs and went back to 0 and 0%. It was very painful. I’ve seen a woman regress in dilation because she got (very) cold. And I’ve also heard this can happen when a woman doesn’t feel safe, maybe when an unwanted person or care provider steps into the birthing room. It’s totally possible! But just as your cervix can close, it can just as easily open. You’ve got this! This is a nice summary. I.did have a birth doula client with prodomal labor of 12 days. She then went with Pit and an epidural. She did do all stuf mentioned in article. Any other tips? I wish I had known about this term with my first child. I had prodromal labour for 2 days and for the majority of that time I was contracting every 8 minutes. At the 2 day mark I went to the hospital at requested morphine to get some sleep because I was becoming a basket case. I got a few hours of sleeep before they woke me up and started trying to induce me. The induction didn’t go well, and I really wish that I had gone in for help sleeping much sooner. I think it might have changed my outcome. Thank you!!!! I copied the last 2 paragraphs to read to myself for encouragement…I am not broken! Just on baby #7…41 weeks and experiencing prodromal labor…helpful article! It’s a little frustrating that you tell your wider audience that prodromal labor doesn’t last for weeks. I’m 34.5 weeks on and have been IN prodromal labor since 29. I may get a break for up to one daylight cycle or even one night and half a day. But I go on average, for 36-48 hurs at a time with period like cramping, hard contractions that make my legs and back hurt, and nasuea preceding each one, every 3.5 minutes. They do sporadically vary and lengthen to up to 10 minutes apart. But most often it’s days at a time, timeable, painful, full spectrum misery at a rate less than five minutes apart. It has been 5.5 weeks of this and I’m barely softening, shortening, or tipping anterior. It can and does last week’s for some of us. I have 5 more to go, minimum. And I often carry late. I had it for 6 weeks with my three year old, and 8 with my 20 month old. Aside from that one (disheartening and invalidating) part of your blog, I am glad to see folks able to find information on prodromal labor. I too am grateful for this article as it does provide some very assuring and empowering information. But just as you never tell any woman they are having false labor because the experiences no matter how varied are not FALSE. The generalization that prodromal Labor doesn’t last weeks only days is also incorrect from my current experience and other research I have seen. I began having regular ( between 2 and 12 min apart) contractions at 34 weeks 0 dialation but 50% effacement. A few days later I was 35 weeks – I was digitally and speculum checked and my midwife encountered a large bloody show and 2 centimeters dialated. We prepared for a pre- term birth and alas here I am at 36 weeks still having strong regular contractions but no movement into active labor to be seen. I personally won’t do any more vaginal exams so we don’t know where my dialation is precisely but the purple line indicates that I’m closer to 4 centimeters… so I would also say MY variation of prodromal Labor is causing cervical change over the past two weeks and a few days it just isn’t amounting into active labor and meeting my baby soon. I am taking the advice and positive outlook of enjoy the time before baby the best you can and take care of my body – rest, eating healthy, lots of water, good yoga stretching and restorative poses, and meditation. I hope anyone else challenged with this atypical experience can do the same and know: your body isn’t broken, you aren’t alone and your body and baby are strong – trust body and baby will work together to come into the world safely when the time is right. My Prodromal labor lasted for weeks also with my first baby. I had prodromal labor from Thanksgiving weekend all the way until January 6 when she was born (3 days past EDD). I had symptoms much like R’s, but my contractions would start up every afternoon until about 10/11pm, painful and timeable @ 3-5 minutes apart,when they would fizzle out. Every night for weeks. I was exhausted. However, when I did finally get to active labor it only lasted 30 minutes. This is a late reply, but to say prodromal labor doesn’t last for weeks is inaccurate. I had prodromal labor for 3 weeks, going to the hospital, with doctors believing it was time, except i just wouldn’t dilate. Timeable contractions daily for hours on end for 3 straight weeks. It’s possible and extremely uncomfortable.